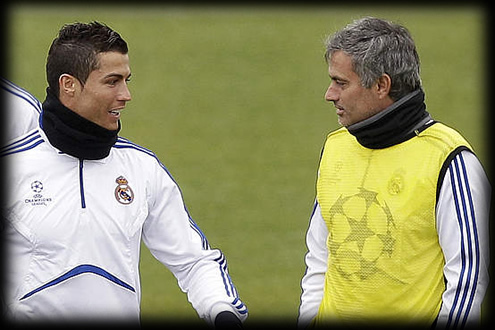 24.02.2011 » José Mourinho: "I don't know if C. Ronaldo is a striker or a winger"
José Mourinho is unsure on Cristiano Ronaldo best performing position. CR7, who is a natural winger, has also developped into one of the most respected strikers this sport has ever seen. Real Madrid coach José Mourinho, has admitted that he is unsure whether Cristiano Ronaldo can be regarded as a striker or a winger, since he sees him as an unique blend of both styles. The "Special One" spoke in an interview with Sky Sports "Revista de la Liga" show, in which he discussed the impact of Cristiano Ronaldo on his tactics, as well as the daunting prospect of overcoming Barcelona this season, both domestically and in Europe. Speaking firstly of his Portuguese attacker, the former Chelsea, Inter and F.C. Porto manager remarked: "We try to find a position that is the most comfortable for Cristiano Ronaldo, and there is always the debate. Is he a forward? I don't think that he is. I think he is great when one-on-one against a rival. Is he a winger? No, because he is also a goalscorer and when you are a winger, how many goals do you score in a season, half a dozen? I think that he is the mixture of two things. He is in great shape and he's more mature now. He has everything." Finally, when asked if he will see out his four-year deal at the Santiago Bernabéu, he remained non-committal, concluding: "I do not know. I love Chelsea, and when I was in London I was the happiest man. I thought I would be there all my life, and a few months later I was out. So you never know. If everything goes in the right direction, I will stay for sure." Real Madrid and Cristiano Ronaldo will play this Saturday against Deportivo de La Coruña and Ronaldo seems to be fit for the match, even though there were some doubts earlier today after the Portuguese player complained about some pains on his ankle, origined by an harsh tackle from Cris, in the match Lyon vs Real Madrid.